The key to harvesting corn is timing. If you pick it too early, it won't reach maximum sweetness and might be too hard. 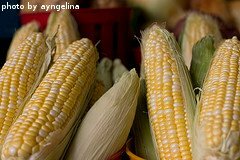 If you wait too long, the kernels may be too tough and starchy. There are several ways to tell if it's time to harvest corn. In general, the ears are ready to be picked 3 weeks after the silks first appear. The silks should be brown and dry. If the ear looks ready, peel back the husk just enough to see the top of the ear. Poke a kernel with your fingernail. A thin, white liquid will emerge if the corn is ready to be picked. If the liquid is clear, the ear is not ripe enough. If the liquid is thick, it may be slightly over-ripe. You can also taste a raw kernel. It should be very sweet and fairly firm. The kernels should fill out the ear, almost to the top. 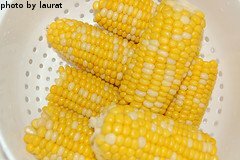 If the kernels don't reach the top of the ear, but all signs point to it being ripe and ready to eat, go ahead and harvest it anyway and cut off the top before serving. If you determine that it's the right time for harvesting corn, hold the stalk with one hand. Use your other hand to grasp the ear and pull it down and away from the plant. It should release fairly easily. If needed, twist the ear slightly to get it to pop off the stalk. By holding the corn stalk, you will prevent the possibility of damaging the plant that might be holding other ears. 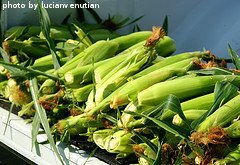 Unless you plan on eating them right away, store the ears of corn in a refrigerator, leaving the husks on. They will keep for almost a week. If you want to wait longer, blanch the ears in boiling water for 2 minutes and freeze in an air tight bag for maximum freshness. After the growing season is over, remove the dead corn stalks from your garden. In general, unless you grind them up into very small pieces, corn stalks are usually too tough to compost. You can burn them or throw them away. So now you have a bumper crop of sweet corn. Ready for a few recipe ideas?